Home Star Wars Autog... Collections Are these signatures genuine? Apologies if this post is in the wrong spot. I recently purchased some signed Star Wars photos from a reputable auction site here in Australia (Leski Auctions). 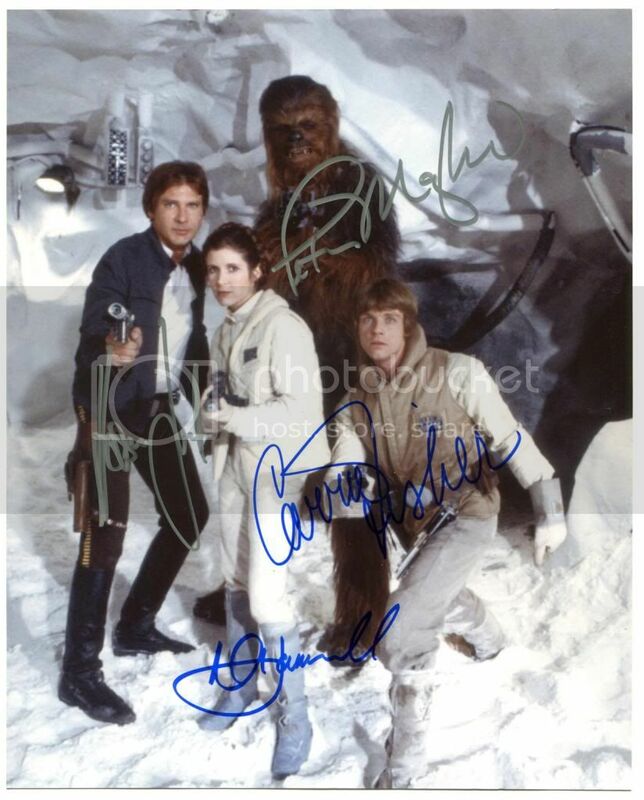 Included in this lot was an 8x10" photo signed by Harrison Ford, Mark Hamill, Carrie Fisher and Peter Mayhew. Just because it seems too good to be true I am wondering about the authenticity of these autographs. I'm hoping your expert eyes could analyse the autographs and you could share your opinions as to how genuine they are. The photo is relatively new - it has printing on the back suggesting it was printed from a .jpg file. I have no other information about the origins of the photo, apart from the fact that it came from an auction where lots of other Star Wars memorabilia (signed or otherwise) was auctioned off. There were 5 other signed 8x10s in the lot I won - Kenny Baker, George Lucas, Frank Oz, Peter Mayhew (with COA) and Dave Prowse (with COA). Would love to hear your thoughts guys! Re: Are these signatures genuine? Thanks Frank, really appreciate your feedback. Pardon my ignorance, but how would I go about getting it authenticated? I've added some scans of the rest of the photos I won in the auction just in case it helps. Here are some scans of some of the successes I've had through the mail over the last 15 or so years!